This property consists of 3 (2 Bedroom/1 Bathroom) Units and 1 (1 Bedroom/1 Bathroom) Unit for a total of 4 Rentable Units. These Units are above average in size at 1,000 SQ FT for the 2 Bedrooms and 900 SQ FT for the 1 Bedroom. The building is fully occupied with long term tenants with below market in-place rents. The property is conveniently located off of Roosevelt Road near many different commercial amenities for the tenants; located less then 2 miles from Downtown Wheaton and the Metra Train Station. The property is within close proximity of major Chicagoland thoroughfares less then 3 miles from I-355, and within 5 miles from I-88 and I-290. The property has been well maintained and managed, the roof has recently been replaced and converted from a flat roof to a pitched shingle roof. 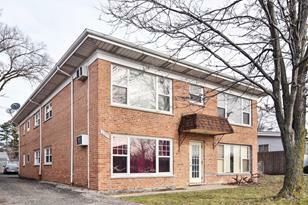 Current ownership has recently upgraded the unit interiors and the common areas and laundry room. Driving Directions: Roosevelt Rd east to building. Second building on North East corner across from CVS. 1407 East Roosevelt Road, Wheaton, IL 60187 (MLS# 10145980) is a Multi-Family property with 4 units containing 7 bedrooms and 4 full bathrooms. 1407 East Roosevelt Road is currently listed for $625,000 and was received on November 29, 2018. Want to learn more about 1407 East Roosevelt Road? Do you have questions about finding other Multi-Family real estate for sale in Wheaton? You can browse all Wheaton real estate or contact a Coldwell Banker agent to request more information.